South Street in Auburn, New York has been home to many American notables with one in particular - William H. Seward - being quite trendy at this time due to the recent movie, Lincoln. But there were members of the Seward family who were behind the scenes supporting him, guiding him, helping him to become a great politician and statesman. One such personage was his quiet and rather unassuming wife, Frances Miller Seward. Raised a Quaker, Frances believed in equality and expressed her views about abolition and Women’s Suffrage to her husband when he was Governor of New York State and later Secretary of State under Abraham Lincoln. The expansive collection of their correspondence is now at the University of Rochester. 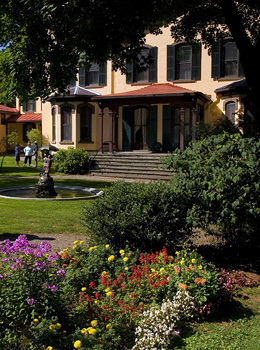 With the Seward House Museum barely two blocks from my home, I often drive past it several times in a day. It is a large and stately mansion painted a lovely pumpkiny yellow with green shutters. It is impressive but not imposing. Yesterday on a visit to the museum, I was surprised when I came face-to-face with Frances Seward as I entered the well-stocked library. She proceeded to tell me that there are 2,500 books in that room alone with over 7,000 total tomes in the home. Her favorites are all collected along one shelf and are primarily religious in nature. Frances did tell me that she enjoys reading having been exposed to Great Literature while at the Emma Willard Seminary which she attended with her husband’s sister, Cornelia. Frances seems quite proud of her home and invited me to view the newly bedecked the dining room. The long tabletop has been set with five different place settings to illustrate various courses; the opulent taste of the 1860’s; formal and informal dining options; and the wide range of cutlery necessary to properly set a fine table. I am rather glad that all that is not expected by dinner guests today. Prominent in the center of the table is a place setting of Old Paris porcelain, the everyday china from about 1855. There are over 200 pieces ranging from dinner plates to demitasse, from tiered cake stands for tea time and covered pot de crème along with serving dishes and much more. The center of each plate did have the family motto, “esse quam videri” (to be, rather than to seem (to be) which has worn off due to use. Fruits of all manner – apples, plums, strawberries, cherries and watermelon slices – are ringed by a clear blue edging and gold leaf. 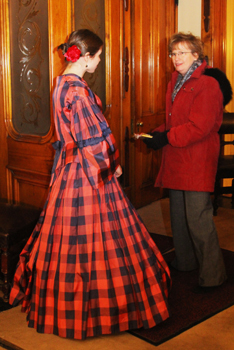 During March which is Women’s History Month, you too can have an opportunity to “meet” Frances and some of the other Seward ladies when you tour The Seward House Museum. These special tours will be held each Saturday in March at 11 am and will last for one hour; reservations are recommended. On March 16, the museum will host “The Hutchinson Family Revival” concert at 1 pm at Westminster Presbyterian Church, which sits just across the street. Local women’s groups will also be on hand to share information. Starting in May, there will be “Fanny Tours” which feature a costumed interpreter using diaries to guide you through the home while telling the story of an important American family. Fanny, William and Frances’ daughter, did not go to off to school but instead was educated by her mother and a governess at home. She was exposed to Milton, Homer and Shakespeare and other necessary womanly skills such as dancing and music and handwork. Her father gave her a diary when she was 14 and throughout her life, she kept track of her daily affairs and dreamed of being a writer. But this was not an appropriate career path for a lady. One can be overwhelmed by the accomplishments of the man of the house, but don’t miss out on learning more about the women who really ran it all. They will surprise you.